Artist Maya Lin has created some of America’s most powerful monuments, such as the Vietnam Veterans Memorial in Washington, D.C., and the Civil Rights Memorial in Montgomery, Alabama. Now Lin is unveiling what she is calling her last memorial, What Is Missing?—a tribute to the earth and its vanished and endangered species. A new kind of memorial that exists in multiple forms and multiple places, the project has appeared in physical exhibits in China, San Francisco, and New York City, and it is currently displayed on a multimedia website (www.whatismissing.net) that incorporates audio, visuals, and science from the Cornell Lab of Ornithology. I recently had a chance to talk with Maya Lin about her project. Visit www.whatismissing.net to share your own personal stories of what’s been lost or diminished in nature in your lifetime. At the website, you can also explore Conservation in Action to see the Lab’s conservation success stories and get tips for simple everyday things you can do to make a global conservation difference through what you buy, eat, and drink. You’ve said that What is Missing? challenges the conventional notion of a memorial. How is it different? The traditional war memorial always commemorates those who have died. I believe memorials are there to remind us and to remember the past, but in such a way that we’re actively engaging the present and the future. They teach us to accurately look at history so we can learn from our history, and hopefully create and shape a different and better future.… What is Missing? is extremely active. It’s going to raise awareness about the loss, the massive degradation of the planet. But it’s also going to step over the line and become an advocate for better practices. It’s going to give people hope [by saying], “This is what the world could look like by 2050, if we just took the steps to plan a little.” If we took the entire world population today, 7 billion people, and we lived in the density of Manhattan, we would take up the state of Colorado.… Is this just a question of population, or is this really a question of land use and resource consumption? You invited several conservation groups to participate in What is Missing? by sharing stories about endangered and threatened species and places, and you opened the website up to regular people who want to share their personal stories of what they have seen diminish or disappear. Are there any stories in the memorial that are especially meaningful to you? How did you come to choose the Cornell Lab of Ornithology as a participant in What is Missing? The Cornell Lab has the world’s greatest repository of natural sounds [in the Macaulay Library], and that makes it possible for people to hear something on the website before they see it or read about it, and so that story talks to you on a more emotional level. When I met [Lab executive director] John Fitzpatrick, he was so generous with what the Lab has and what it knows, and so the Lab became critical to how the artwork started to form itself.… The Lab is incredible, and the more I work with it, the more I want to tell other people about it. Last question, what’s your favorite bird? I love the Eastern Meadowlark. I always have.… If you look at some of our most common songbirds, there’s a 40 to 70 percent decline. 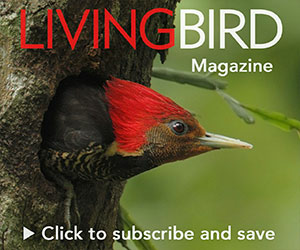 So definitely the bird songs that we all heard in our backyards have significantly diminished.… [The loss of biodiversity is] happening right before our eyes. And we need to be aware of it, and we need to make others aware of it. And we need to share what we can all do to help. And we need to stay really optimistic. Because the alternative is, what, we give up? I’m not going to tell my kids that I didn’t try really hard. Because the woods that I grew up with were so magical. And I want to try to get some of that back.